We have been asked recently to present a summary of advantages that BoneStation provides to users. In this blog we first list what we believe are the key advantages our reporting solution brings compared to traditional methods. We then refer the reader to the results of a mini survey we sent to our current power users. possibility to customize your patient questionnaire. We sent out a subset of ten of these points to our current power users (mostly physicians, and a few technologists) and ask them to pick the 3 most important benefits to their practice. BoneStation is a web-based reporting solution which increases the productivity of bone density testing providers, including technologists, physicians, and administrators. In this article we focus on physicians who are responsible for the review and interpretation of BMD and VFA scans. The physician will essentially do the following: select the exam to review, assess the technical quality of each scan, and generate the report by filling in the various components (Assessment, Recommendations, Fracture Risk, etc). We describe that process in further details below. The physician starts by looking at The Review List, a list of recently performed BMD scans which need to be read. In this case the system shows 29 exams ready to be reviewed. Notice the drop down menus at the top. These are particularly useful in situations where there are multiple DXA machines and multiple reviewers. The Exam Date filters the list to show scans performed on a particular day. The Location filters the list based on the DXA machine’s geographic location. The list can also be sorted by Patient, Exam Date, and Referring Physician. 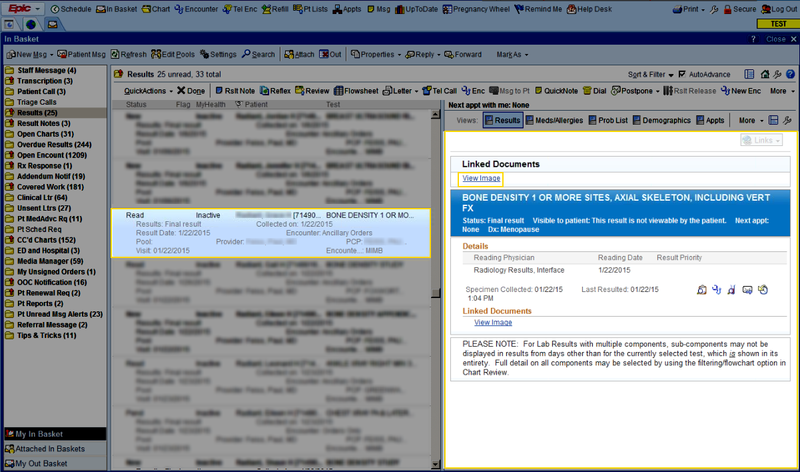 In this Review Step 1, the physician initiates the review process by clicking on Create Report (left button). Review Step 2 appears as “Select Comparison Scans”. 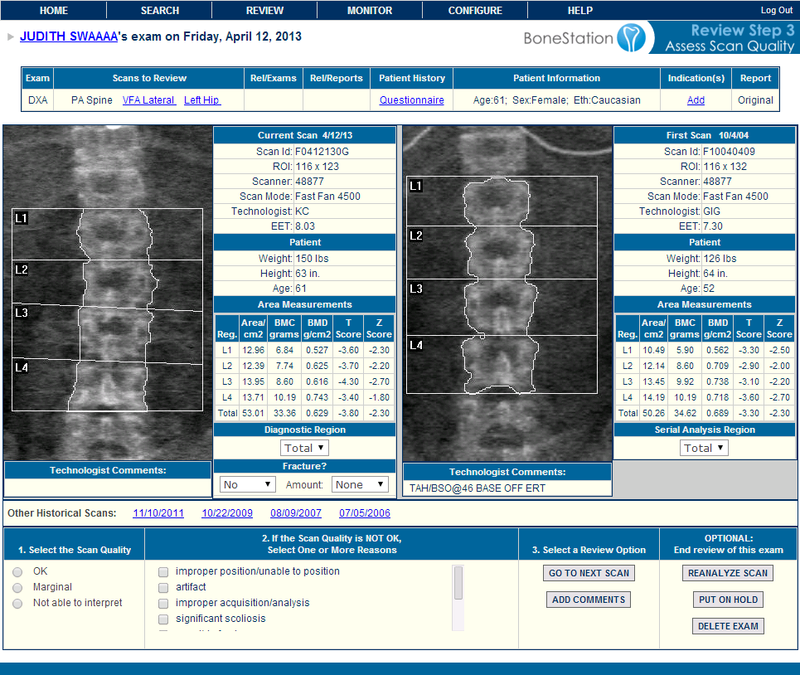 During this step the current PA spine scan and all historical PA spine scans are displayed in summary fashion. 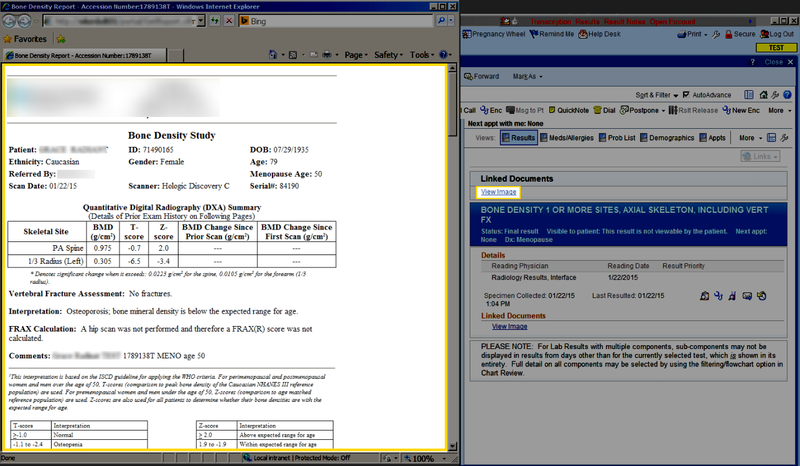 Prior scans that the physician does not want included can be excluded from the report by clicking the Exclude checkbox. Scan mode differs and is highlighted. 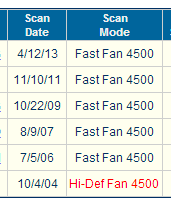 Looking back at Review Step 2, notice that “OK” appears in the Tech Quality column for the 11/10/2011 scan. The 2011 scan has a report that was created in BoneStation and its technical quality was evaluated to be OK at the time of review. Clicking OK pops up that report for immediate viewing. Click the Continue button to move to the next step. On Review Step 3 one can compare the images of the current scan and the baseline. Additional images, with scan data, may be viewed by clicking the dates in the Other Historical Scans section. On Review Step 3 the reviewer indicates the technical quality of the scan as either OK, marginal, or uninterpretable. When one of the latter two is selected, one or more reasons must be picked in the second column. If a scan is designated as uninterpretable, it will not be used in the final assessment. It is also during this step that a reviewer may request for a scan to be reanalyzed. In this case the physician reviewer is prompted to send instructions to the technologist via email. 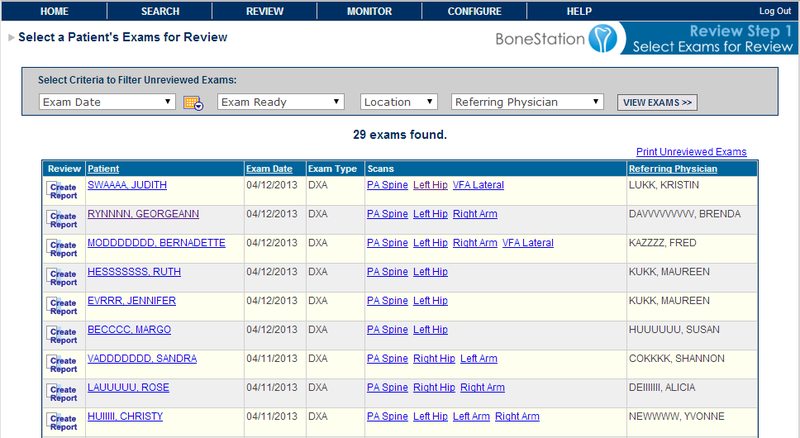 The scans are retained in BoneStation in a separate “Awaiting Reanalysis” queue. Clicking the Go To Next Scan button repeats this process for the remaining scans. When the final scan is viewed, the Go To Next Scan button changes to Add Recommendations. At this point the content of the various report sections are filled in. The Comparison To Prior Studies section gives a verbal description of change. The Assessment section gives the interpretation. 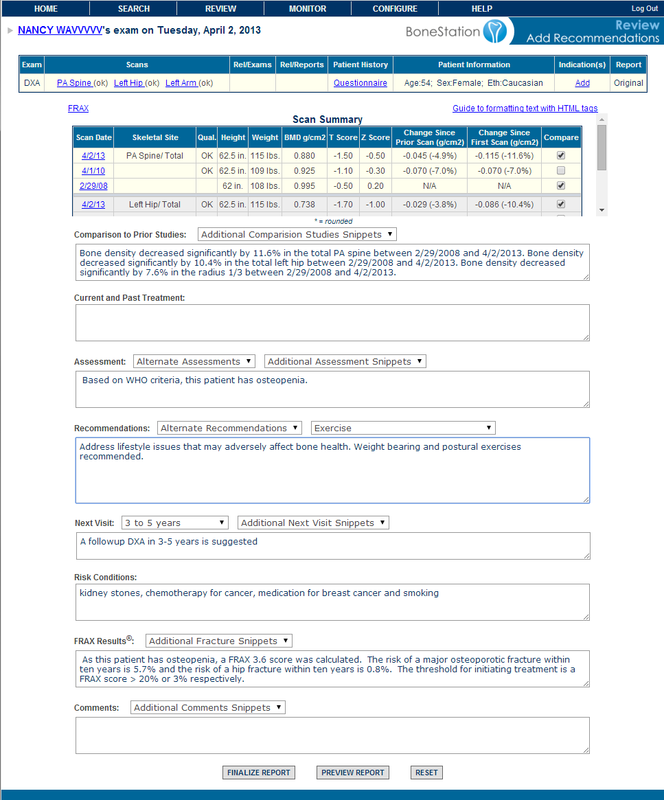 The Current and Past Treatments section lists treatments as entered on the electronic questionnaire. We did not discuss the questionnaire much during this article. Note that it is available throughout the review process via the Questionnaire link. Next visit is the suggested followup. FRAX Results is the fracture score. In the above example a FRAX score was not calculated because the patient is osteopenic. Comments provides for general comments. Note that there are drop down menus with many sections. These contains macros of frequently used phrases that may be easily entered in to the report. The physician can also manually enter information into any section. This was a brief overview of the review process. Many features, such as the integration into EMR systems, were not described or were only touched upon to keep the article short. If you would like to learn more, feel free to contact us. Of course we are happy to hear from you if you have specific topics you’d like covered in future articles. Thank you. This posting is the first in a series that discusses cloud based computing and benefits to bone density providers. For a brief description of The Cloud and cloud based computing, see our prior posting. In this posting, we focus on the questionnaire aspect in the context of DXA-based bone density reporting. We specifically examine the benefits of an online questionnaire which is stored in the cloud. With the advent of FRAX, patient history questionnaires have taken on new significance. The FRAX algorithm requires knowledge of the patient’s risk factors and these are typically collected via a questionnaire in one of different ways. We will show key advantages offered by The Cloud compared to non-cloud based questionnaire solutions. Today, DXA machine software includes a questionnaire for use with FRAX. Both Hologic and GE/Lunar have added this capability. The presumed workflow is that the DXA technologist fills in the questionnaire at the DXA machine, prior to scanning the patient. The technologist scans the patient, analyzes the scans, and a FRAX score appears on the DXA machine printout. Technologists and physicians can view and/or modify the questionnaire from anywhere as long as they have access to the Internet through a Web browser. Physicians can easily recall the questionnaire corresponding to a specific report, since the questionnaire is stored centrally. No need to walk to the DXA machine. Busy bone density providers benefit from an improved operational workflow. For example, with BoneStation, a questionnaire may be entered before the exam takes place. The questionnaire is stored in a queue. When the scan is performed, the questionnaire in the queue is associated with the exam. The questionnaire can be modified without disrupting workflow. In a cloud-based solution that incorporates FRAX, such as BoneStation, there would be no need to change a question on the DXA machine in order to recalculate a FRAX score. New opportunities for Quality Assurance and Research are enabled. This is because questionnaires become easily data-mined, as a result of being part of an enterprise class software. All questions (and associated answers) are stored centrally. This may be particularly important in multi-DXA operations. One could even envision the patient accessing his or her questionnaire (for example to review its accuracy). These benefits to the technologists, physicians, researchers, operations managers and ultimately patients, are characteristic of enterprise class software. Enterprise class software tie teams together in their work environment, making them more productive through collaboration and workflow. We probably have not exhausted the potential benefits and opportunities offered by online, cloud-stored questionnaires for bone densitometry. We thank you for reading this blog, and welcome your suggestions and comments. The current trend in software is “The Cloud“. Maybe you’ve heard of it? What does it mean for bone density providers? In this posting, we’ll provide an overview of the cloud. Future postings will assume this very basic understanding of The Cloud. In short, The Cloud reflects storing of data on the Internet. Some examples are online banking and email (such as gmail). In these cases, the checking and savings account info and email may not reside on your PC. Instead, the data is on a “server” somewhere out on the internet (“The Cloud”). Access to data is typically provided through an application that is usually a web browser, but not always. For example, banks typically provide a web based application to log in and manage checking and savings accounts. Google provides email access through http://www.gmail.com. You may also access gmail through an email client, such as Thunderbird or Outlook. Mobile access to your email is via a phone app. In understanding cloud-based computing, it may be useful to contrast it with the old way of doing things – desktop computing. With desktop applications, one worked in a more isolated manner, on a PC. Data is stored in files on the PC’s hard drive. While it is possible to share and collaborate with others, it requires more work than cloud based applications. In terms of business applications, including bone density practices, cloud based applications are likely to be classified as “enterprise class” applications. Enterprise class applications are characterized by making entire teams work better and more efficiently. The next few blog postings will highlight some benefits and touch upon how Cardea Technology‘s BoneStation realizes the benefits of the cloud via as an enterprise class application.